Ten years ago, Amitabh Bachchan was tired. The disgruntled superstar, after seeing his contemporaries over a three decade career wither away into alcoholism and obscurity, was watching himself fall into Hindi cinema’s inevitable age trap. He was too old to stay the leading man, yet that mammoth last name had spent far too much time as the headline to allow him to drift smoothly into the comfortable unshowiness of the character-actor niche. The nineties were an exhausting decade for the actor. 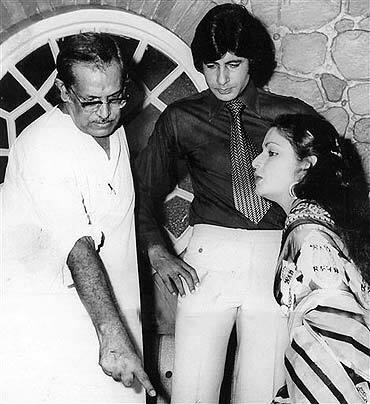 ABCL wasn’t the runaway success it was heralded to be, and while Bachchan found acclaim with Agneepath and Khuda Gawah early on, he took a five-year hiatus while the Khans made the industry their own. He returned in 1996, but the films that followed mark the most embarrassing, ignominous section of the actor’s oeuvre. “Where are the stories?” Bachchan had asked screenwriter Kamlesh Pandey in a June 2000 profile in this magazine, this one that just turned ten. He opined that he had never felt more ready to take on challenging parts as an actor, but his frustration was evident. Our industry is fixated on youth, and senior actors, instead of being given the chance to blossom, find themselves invariably whittled down to weakly written character roles. Any possible malaise Bachchan, fresh after failures like Laal Badshah, Sooryavansham and Hindustan Ki Kasam, might then have felt would be well justified. A month after the interview, there came Kaun Banega Crorepati. The word phenomenon might be bandied about loosely these days, but here it fits. KBC was a historic success, one that defied conventional wisdom and expanded the very boundaries of television in our country. Suddenly, everyone wanted a piece of Bachchan, the man who emptied the streets of traffic come 9 pm. Even as the country fell back into enchantment with its biggest cinematic icon, the actor within discovered a gamut of highly experimental roles. No boundary seemed sacred anymore as he went from being a maniac with a mad laugh to a jaded bank employee orchestrating a robbery by blind men. 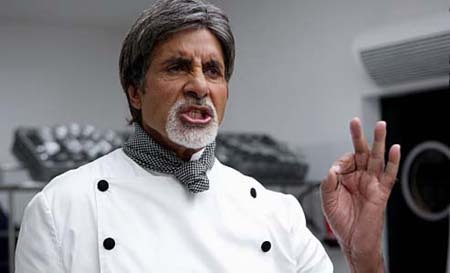 Gangster, cop, godfather, armyman, alcoholic, forgotten father, flamboyant father, item dancer, rapper, teenager, ponytailed chef, palace guard, theatrical ham, genie… Over the last ten years, Bachchan’s been them all — from ghost to God to Gabbar Singh — and even been brave enough to just play a dirty old man. 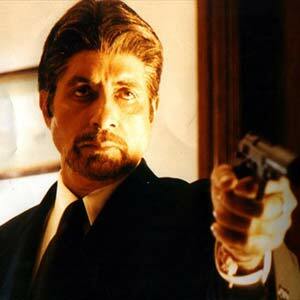 Outside of that, there have been far too many endorsements, and too much Bachchan all over the place. A stomach ailment is national news, as is his son’s wedding. The man has the energy to support causes and endorse states, go on long world tours, host gameshows and appear on ones he isn’t hosting. He promotes his films like he blogs, with the sometimes exasperating enthusiasm of a much younger, more reckless man. 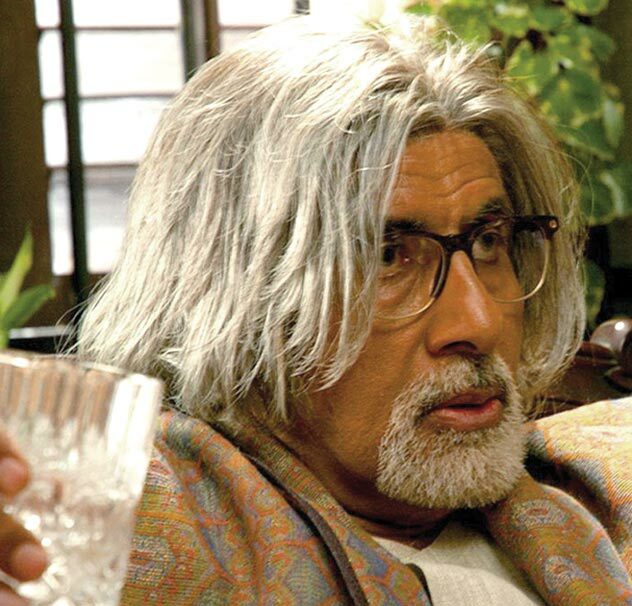 Heck, at 68, Amitabh Bachchan is the industry’s single most prolific actor, hungrily snapping up 6-7 releases a year when other actors are content with two. There is criticism, of course. Is he trying too hard? Is he taking on films just because the roles are gimmicky enough to create a fuss? Is he acting bizarre for the heck of it? Is he exposing himself too much? 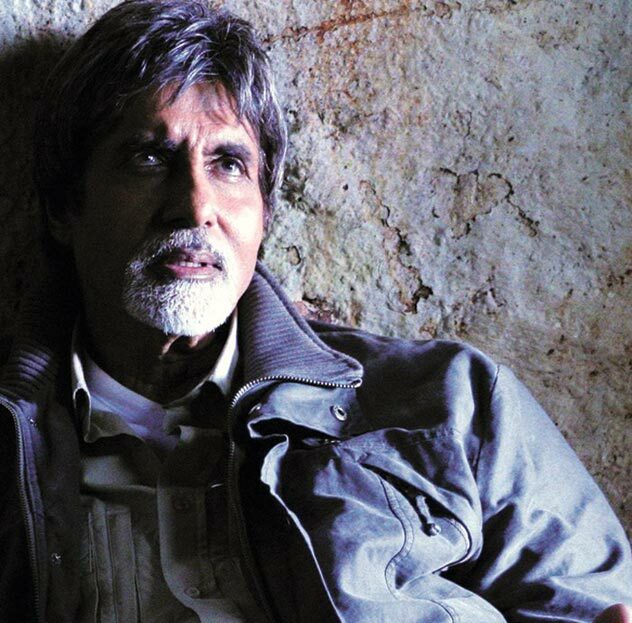 Is Brand Bachchan becoming more important than the actor? Is he working too hard? Should he stop with that many ads? Where are the stories, he had asked. He, himself the story. The industry, now in flux, is still changing and chopping itself, bending over backwards to accomodate this one man who refuses to be anything less than legendary. 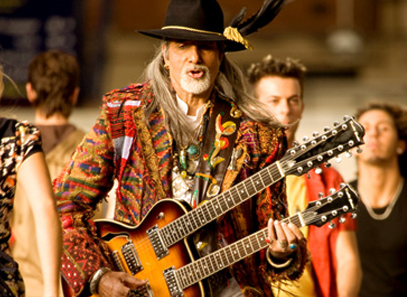 Forty years after he first began, Amitabh Bachchan is still raring to go. As for the stories he demanded, like another film about instant millionaires and that gameshow said, they are written. You were on one of the first few Man’s World covers ten years ago, and in that profile, you had mentioned that meaningful roles were hard to come by. Since then, however, Hindi cinema has redefined how it looks at you and given you a huge scope to reinvent yourself, constantly. Do you think the inconceivable success of Kaun Banega Crorepati gave our filmmakers the confidence to write you into central roles? I cannot say. I do not know the circumstances that made me make that remark, it must have been just an offhand remark. But yes, when you pass a certain age in the film industry, you’re obviously not going to get the main role, the leading role. And therefore, there are character roles. Now you may make up your mind at that point of time whether you want to go into a character role category or do you still want to… Many actors do not want to be put into character roles, many accept that and do it. I accept that I wanted to work, and I’m happy doing character roles. KBC’s success was quite unusual, I thought. I don’t know whether that had a reflection on the thoughts going into writer’s minds, but if it did, I’m very happy because I was able to get an opportunity to work, and there were some very nice opportunities created after that, whether it was for Baghban or Dev or Black or Paa. There are so many of them that came after that, and I’m very honoured that people were willing to consider me for these roles. At that stage of your career, did KBC seem like a gamble, a risk? You know, I think in the world of creativity there will always be risk. Whatever you do. Because creativity is something that is very personal, very individual. I may think that I am doing something great, you may not think that or the public outside may not think that, and you have an opinion. I think creativity can always be looked at in the manner that you suggest: yeah, I’m going to be doing a painting, I’m going to be doing a performance, I’m playing this instrument… and it’s up for criticism. I’m putting it out to you; now it’s up to you whether you like it or not. So yes, when I was offered television, yes it was a departure from what I was doing. And whenever you do something which is not tested, you tend to be a little hesitant. Much like I was when I wanted to join films, you know. I was doing an executive job in Kolkata and I was happy and content within the circumstances. At that point of time getting a Rs 1200 salary, having a car, having a house.. these were all certainly very beneficial. And to leave all that and come and join a film industry without salary… that was, in a sense, a risk. But I think you have to follow what you feel. Having done film and then to look at another aspect of creativity that is television… everyone said I think you’re doing something wrong, from 70mm you’re reducing yourself to 25 inches, that’s a big risk. But I was at a stage where I wasn’t doing much. My work was not being appreciated. My films were not doing well. I saw this show, Star TV was very keen that I do it. I just looked at it as another opportunity. They took me to England, I saw the original recording with Chris Tarrant who was doing it at [the BBC’s legendary] Elstree Studios. I liked and I said if you can give me the same kind of management and everything, I’d like to attempt something like this. Fortunately, it worked. And whether it changed the mind of future directors to cast me in different kinds of roles, I don’t really know. They would be better placed to answer this, but yes, definitely it gave me a very large visibility. Television is so strong. Three days after the first episode was aired, I went on a pilgrimage to Amarnath and there people were talking to me and saying ‘hey, kaun banega crorepati!’ So that is the strength and the power of this medium. Coming back to the kind of roles that came in.. It was a new niche, so to speak, that of the ‘mature leading man.’ A lot of the characters have been outrageous, and bizarre. Do you perhaps sometimes feel that — there being no point of reference here — you just looked at all of these as fresh opportunities and were just taken in by the enthusiasm? And might have taken on too many films in this exuberance? Yeah, it’s possible because once you get an opportunity to work like this, if for some reason people like it or it succeeds, you tend to get drawn into it many more times. And that keeps happening. I don’t have anything else to do, I was getting these opportunities and I thought I might as well work. So I kept working. And maybe, yes, there has been criticism that you’ve taken on too many of these films, and that you’re working too much… you know, if I can manage my life and my schedule, and people are not too unhappy with my work, then if I’m being repetitive, I’m happy to. You know, at 68, you can’t look at some kind of peak that you have to reach or some kind of mystique (laughs) that you have to maintain. I’m curious about how you choose your roles. When there’s a completely new character, and a completely new director… Say, something like Rakeysh Mehra’s Aks, a role unlike any other role. What excites you about scripts like these? Anything that is like a challenge to me or tests my creativity or gets me anxious or gets me butterflies in the stomach or gets me nervous the previous night, thinking ‘what am I going to do?’ I think that’s with any actor. And I hope it keeps happening to me. It’s nice to be looking at new challenges and new ways to address your creativity. Do you think directors are trying to write parts for you which are different specifically for the sake of being different? Do you think that’s happening? I, I don’t know. This is something they would have to answer. I’m just happy getting the roles. But do you end up being more preferential towards a part that is, say, very wild and outrageous as opposed to a more sedate part? I think that I’m at a stage where the onus and the responsibility of the leading man, and therefore the onus and responsibility of the success of the film, and its marketing and its sale etc, is really not on my shoulders. Therefore, let me do what is coming my way. Therefore to do something like a Nishabd or even a Ram Gopal Varma Ki Aag where… I enjoyed doing them. Okay, people didn’t like it and they trashed it. And that’s fine, we must respect that. But I didn’t mind doing those roles because they tested my creativity and I enjoyed doing them. At this stage after forty years in the business, what is your personal barometer for a successful performance? The critics, the box office, how you personally felt..
Yeah, it’s really two ways. If you’re not happy doing what you’re doing then you’ve got no business being in that project. So I think initially you have to be convinced that you have to go ahead and do it. Otherwise there’s no compulsion as such. Unless there’s a binding contract to do it, but that’s a terrible stage for any artist, to be doing something under compulsion, under some force. So when I’m doing it I’m enjoying doing it. Now, coming to the other factor, whether people liked it or not. That is also a criteria we cannot force. That’s dependent upon choices of people and we must respect it. Exactly, which is rare. And this happens in life, some things work and some things don’t. I think it’s wonderful if you get critical acclaim as well as box office acclaim, and obviously Paa will be revered as far as we are personally concerned. But nothing to take away from my attempt at doing a Nishabd or a Ram Gopal Varma Ki Aag. You’ve often been described as a ‘director’s actor,’ in the sense that you get into the character and do whatever is asked of you. Is that hard these days, when the director is 30 years younger and a diehard Bachchan fan, who has grown up on your cinema? Do you feel that they sometimes lose objectivity? Yeah, that’s an interesting question. I normally would want to listen to the script first, see my story, and then through the narration or the interest the director shows towards me, I would want to gauge whether this is something that he’d be able to handle. And I try really hard because a number of times people will come and tell me a narration and say ‘sir, this is the scene and you come out and then [claps hands theatrically] that Sharaabi attitude, or that Deewar dialogue.’ And that’s putting off, for me. If you’re identifying me with something that I’ve done in the past, I don’t like that. There are many people who have come forward with stories which are caricatures of something I’ve done in the past, or there are references. When I was doing Aladin, when Sujoy said… when [my character] goes inside Ritesh’s brain, there is a reference to the Deewar dialogue. And I was uncomfortable doing that. I told him but… I didn’t want to break his heart. These sort of moments where I’m a character in a film, but I’m making reference to something which has gone on in my earlier films.. It’s out of character and it’s not right, and I’m very uncomfortable doing that. Over the last ten years, Hindi cinema has evolved in quite a major way. From your rather unique vantage point, what do you identify as the milestones? For the industry? I think that the quality in the making, technical qualities have vastly improved. There is also a great sense of wanting to make something different. There is also a change in the perception of the audiences, I think they have changed. Which I think is very good because they challenge us to do something different. How this is happening, why this is happening, I don’t know. My own reading is that we are now exposed to a lot more mediums — television, radio, internet — which acclimatise the prospective viewer to whatever is happening in the rest of the world. And therefore, if you’re going to get something to see in your house, free of cost virtually, why are you going to spend 500 bucks going to a multiplex to see a film which is not of the same standard as what you’ve seen on TV. I look upon that as an incentive for today’s makers to improve their quality, so that they can pull these guys out from their homes and bring them to the theatres. In that sense I feel that we have made vast progress. There is always this criticism that the lyricism and the poetry and the language and the dialogues of the past, the written word, is not so prevailing now. To some extent, yes. For somebody that has lived through those years and come back, I feel that when I go to concerts and when I go to public events, nobody asks me to recite dialogues (laughs) from Baghban or Paa, they say ‘can we have Deewar?’ or ‘Can we have Agneepath?’ or whatever. So I’m assuming, therefore, that there was a lot more strength and value in those than what we have now. But I think that, in defense of today’s generation, maybe they don’t want it. They don’t like too many words. This generation is very cryptic in the way it communicates, they’ll have just one or two words where we used to use four of five sentences in our time. That attention span has become very short. So they use one or two words, ‘it’s cool’ or ‘you’re rocking’, to describe the whole feeling. That is the style of the younger generation and if this is what they want, we must make films that follow it. But would you personally prefer cinema that paid more attention to the written word? Well, you know, one of the moments for any actor is to have those grand soliloquys, and say some nice dialogues. I don’t know if today’s generation is too keen on doing that. Interestingly, your last release Rann ends on just such a long soliloquy from you. Coming to Rann and actor-director combinations over the years, you’ve had consistent collaborations with directors which you’ve maintained. With Hrishida, Prakash Mehra, Manmohan Desai, and now, with Ramu. Is it out of a sense of loyalty that makes you stick by them? It’s just that sometimes you get comfortable working with somebody. There is a certain amount of trust that you develop. You feel that they will be offering you something where you will feel comfortable doing it. And everytime Ram Gopal Varma has made me an offer I have, almost without questioning him, gone ahead, because I trust that he is going to give me something interesting to do. I feel that he has done that in all the offerings, including the remake of Sholay, because I felt that I get an opportunity to play a negative role the way I would like to, even if yes, I might have come under severe criticism for doing that. Is this born out of an ‘old school’ need for filmmakers to turn into an extended family, like we see with Scorsese and De Niro, for example? How close have you been with your directors, personally, over the years? Yeah.. I don’t know what you mean. We meet as often as we can, we talk. But is there a non-working equation as well? Um, Ramu is totally, how should I say.. he has problems mixing with people and having a social life (laughs) and it was a helluva problem trying to get him across to Abhishek’s wedding because he can’t stand all this. But on occasions like this we do meet, Balki and Rakeysh Mehra and a few others, Kookie Chopra and everyone. When you’re working as hard as you do, and on these many projects, how important is it to have a personal camaraderie with your fellow actors? I think it comes very naturally. Yeah. It’s wonderful to be light and informal rather than aloof and indifferent. No, why should they be awed? There’s no reason for them to be. I’m as scared to be in front of them as they are. I’m glad to say it’s all very normal and happy. You’ve kept away from active politics for a long time now, but you’re surrounded by active politicians — Jayaji and Mr Singh are both MPs. Is there ever a point of discussion? Do you get involved in the political conversations? No, I don’t, I don’t. I’ve left politics. It’s interesting that when there was something between you and Raj Thackeray, between Aamir and Mr Modi and currently we have the Shah Rukh situation… why doesn’t the film industry speak as one voice? Why isn’t there support shown openly for one of their own? You know, these are all very individual issues and everyone has their own opinion and ideas about it. I don’t ask them why they do a particular film or a role, so I think it’s best left to how they individually want to handle it. The industry’s all united, we are one people. It’s a very strong fraternity. Every time there is a national crisis, we’ve always come together. Abhishek is roughly the age you were when you did Sholay. Do you feel his best days are ahead of him? Yes, I would hope so. I feel that he has been taking small steps forward. He has, I believe, still a long way to go, and I hope he reaches there. Over the last ten years, you’ve acted with him several times. How would you trace his growth, an actor’s assessment of another? I think he grows with each film. I like that. In each film I see a certain amount of maturity coming in his performances. I notice the work that he does and how he labours to improve himself, and that’s a good sign. I don’t think that he’s somebody that will rest on his laurels, whether it’s Bunty Aur Babli or Dhoom or whatever. He’s also somebody very keen to do different kinds of roles, which is very interesting. So I find him growing as an actor in each film. That’s good. For a leading man to carry the Bachchan last name is an invariably difficult task, and now that you see him finding his stride to some extent, how do you think he has coped with the pressure? I think the pressure seems to be with people who talk about it. (Laughs) He’s perfectly fine and I’m perfectly fine. And we work together, we’ve worked well together in all our films. And it’s wonderful to have him on set. We talk, we discuss, we move ahead. But I don’t find him buckling under any kind of pressure just because he’s my son. I myself don’t think that there is any great achievement that I have done, so I don’t see why he should be burdened. He is himself an actor and he has gotten roles and successes in his own right. Jaya and I have never interfered in that, we’ve never put any kind of pressure on anyone, at any given point of his career, that they should be interested in our son. We never produced a film for him, never launched him. Maybe because we didn’t have the means to do it, but also because someday he should be able to stand up and say that wherever he is, and God willing if he does well, that he did it on his own. We’ll always be there as caring parents and support him in whatever he does, but I don’t think that either Jaya or me have gone out of our way to recommend him or canvas for him. Whatever he has got and whatever he has done, has been on his own merit. As actors yourselves, both of you, without taking names of films here, are you critical of his performances? Oh yes, of course. And so is he. If he doesn’t like something that I’ve done, we talk about it. As an actor, in terms of process, when you’re getting under the skin of a character, how hard is it to switch from one to the other? Other actors do one or two films a year and you have significantly more releases, so how difficult is the journey from one character to the next? The length of my roles is smaller, so not too many days are required. Unlike the leading man, who’ll shoot for longer. Rann, for example, I finished in ten days, or seven days. So there’s not much time required. And I think my generation has been used to working in two-three shifts. The old system where we used to work round the clock, 7-2, 2-10, 10-6 the next morning, doing three different films in three different locations. Sometimes in two different cities. Sholay and Deewar were shot simultaneously (laughs) for an entire week. I used to do the climax of Deewar in [Mumbai’s] Ballad Pier at night, shoot all night, catch the morning flight to Bangalore, shoot all day for Sholay. Then the evening flight from Bangalore and shooting here. Did that for a week. Physically or otherwise, do you isolate yourself to prepare for a character? I don’t utilise any kind of practice. I really don’t. I just go there, they give me my lines, I do what I feel is right, till they seem to approve it, and then I move on. Not really a catharsis. I now find it as a compulsion, because there are expectations from the people who are reading it, and I feel I would be disappointing them. And they wait, and I don’t want them to wait (laughs), so I write. If I’m a little late, they will quickly respond: what’s happened, what’s wrong, have you gone off to sleep? I like that little interaction. It’s very wonderful to share yourself with many people who you knew were there perhaps but now they are, in a sense, almost physically in front of you and you get to talk to them and get almost an immediate response. I think it’s a wonderful medium because yes, we knew there were fans, and they used to express their opinion and we used to get fan letters and reply to fan letters ourselves, but now it’s almost like sitting across the desk and chatting, discussing ideas. I talk to them about various things, what goes through my mind, what goes on through the day, about various issues. I seek their opinion, they give it back to me. There are some very intelligent responses that come in, there are some with such deep analysis that I am shocked that they think like this. There is criticism, and if they have not liked my film or hated something I’ve done, they will express it very vocally. There is no moderation. There are abuses, very, very severe abuses, but I think that’s the medium and you have to allow that. Because you can’t expect to be just hearing everything nice about you. It’s wonderful to know how people think. Why they’re abusing, what kind of language they’re using, and what is their issue and how they think. I think it’s wonderful because somewhere in the back of your mind, these thoughts, these criticisms, these suggestions remain, and next time you do something unconsciously, you may be wanting to keep that in mind. Coming to the next film, Teen Patti, how was it working with Sir Ben Kingsley? Sir Ben, yes. Wonderful, absolutely. Very normal, very relaxed human being. Very nice, very gentle, caring, very humble. Very well prepared, he knew his lines when we didn’t know our lines. Used to feel very conscious about that. A great joy, we spent a couple of days together. Is there a difference in approach? In terms of the way both of you tackled the characters, the script? Different schools of acting, perhaps? Ahh, no. Obviously the portions with him have been shot in English, and his performance is obviously going to be a lot superior to mine, because I’m not used to conversing and performing in English. They are more… I find that for them it is a lot more advantageous. For us, when we have to perform in English, sometimes we falter. Not so much in Hindi, because that’s our language and that’s how we’ve been making all our films, but it would be interesting. I did a film in English for Rituparno Ghosh, The Last Lear. I found that to be a very interesting exercise. You suddenly discover that the temperament and the tone that you use, and the feeling that you have in your thought in, say, Hindi, is not the same when you’re speaking in another language. Just in terms of inflection or overall? Overall. The English language is perhaps a little more refined in expressing a particular mood. It’ll be different when it is done in Hindi or Marathi or Bengali or Punjabi. So when you’re doing a film in English, to catch that temperament and keep it throughout becomes very difficult. In The Last Lear, the character is a Bihari who’s settled in Bengal. So basically a Bengali. But he has been a stage artist and he’s been performing Shakespeare, in English, on the Bengali stage. So I just felt that most Shakespearian actors never seem to get off the stage. They’re very theatrical in whatever they say, whatever they do. Their movements, their walk, the way they talk. So when he was talking, his gestures, they were all very Shakespearian. But there were moments in the film when he was very vulnerable. Also he was a theatre actor asked to work in a film, so there was that.. theatre people have a superiority complex, that we are better than these people who work in film. And so I tried to bring that. And then there was a portion when he’s drunk, and when you’re drunk you become who you are, and so we brought in that Bengali flavour, and the tone of the English language spoken in Bengali. So it had lovely inflections. But yes, English is tougher to act in. You made the point that modern scripts aren’t as lyrical, but there is a lot of spoken English used in them. So for someone like an Abhishek or a Ranbir, young boys naturally used to a lot more English, the new scripts might offer an advantage. Yes, it’s mostly English with him. This is my greatest complaint against Abhishek that he doesn’t speak enough Hindi at home. I keep telling him that you must converse, because otherwise you’ll never get the right intonations. And yes, I feel there are some defects in his deliveries at time. And he makes an effort to improve them. But yes, I find that today’s generation relies a lot more on English. Even the Hindi dialogues are given to me in Roman English. I can’t read that, I don’t like that. I like to read it in the Devnagri script, it’s beautiful. So that’s sad but I hope that’ll change. What are the upcoming projects you’re most gung-ho about? I don’t have anything beyond Teen Patti. I haven’t taken on any film. I finished all of these films in May last year, and because of the multiplex strike, they all got bunched up. There was Aladin, there was Paa, Rann, Teen Patti now, and then there’s Shoojit Sircar’s Johnny Mastana, which is into some kind of legal problems, so they’re holding on. So I thought let me wait until all these release and then I’ll take on new projects. Are there any new scripts that are really exciting you? There are, there are some that I’m considering and looking at. There’s Sanjay Leela Bhansali’s production, and Pritish [Nandy] has a script he wants me to do. And a few others have narrated ideas. Let me see how it goes. First published Man’s World, March 2010.
very good and in depth questions- its never easy interviewing this man – so its a creditable achievement to elicit such elaborate response from this great man – instead of the usual diplomatic answers he usually reverts to when he’s not interested – so good work raja – hope some more interviews from you with other different personalities/legends- looking forward to one with mani ratnam /ar rahman/ mamooty . cheers dude . keep ’em coming. This comment is unrelated to the article published. Just wanted to get a recent movie to your notice. Please see Vedam, a recent telugu movie and if you have the patience see also Gamyam by the same director. Sure you will love it. Bravo!!! Excellent. Low bow to the man Mr. Bachchan and hats off to your fantastic article. Well written.